Violet and Jay are finally dating, but adjusting to the new relationship is not as easy as Violet anticipated. Especially when she has to split Jay's time and attention with his new best friend, Mike, and Mike's pesky younger sister - who happens to be obsessed with Jay. Meanwhile, when Violet's special abilities lead her to the body of a young boy, her tip to the police puts her on the radar of the FBI. Violet tries to fend off the FBI's questions while maintaining the semblance of a normal life, but somebody's leaving her threatening notes and an echo around Mike's house reinforces that all is not right. Violet is forced to admit that perhaps the only people who can help her figure it out are the very people she's desperate to avoid - the FBI. After reading (and absolutely loving) The Body Finder, I was really excited when I received the second book in this series for review. Violet's life has changed recently. Several months back, she helped find the bodies of several missing girls, which led to the serial killers being caught. Well, one of them died. Her relationship with Jay continues to bloom, though it does come with its own complications. Since they admitted to being in love with each other and Jay almost got killed trying to save Violet, he's a lot more protective of her and sometimes she feels like she can't depend on him the way she did when they were best friends. And the fact he's made a new friend lately--a new boy in town, Mike--doesn't help. The only constant in her life is her ability to feel/hear the dead calling to her, as well as the matching imprint left on the killer. So the day she goes into Seattle with her friend, Chelsea, and finds herself following the sound of a harp into a shipyard, she returns later and calls 911 to report what she found. Soon after, a little boy is found inside a container, and the FBI finds Violet. 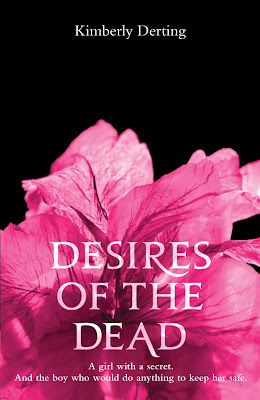 Desires of the Dead was an awesome, intriguing book that keeps the reader guessing until the very end. I loved it, and was hooked from the beginning and found myself totally lost in Violet's life. I felt bad for her, because even though she has people around her who love and care about her, she doesn't want to burden them with her problems and instead ended up not being able to cope. Also, I think that adding Sara and Rafe to the cast gives Violet's gift another outlet, and the possibility of another direction. One, which I hope helps her turn it into something positive.